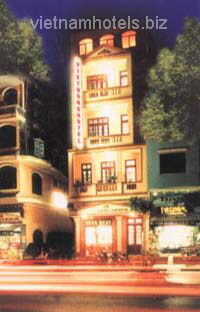 Located in the center of NinhBinh Town. Ninh Binh is located south of the Northern Delta, between the Red and Ma Rivers. It is bordered by Nam Dinh, Ha Nam, Hoa Binh, and Thanh Hoa provinces. The population is made up of 23 ethnic communities, among which the Kinh account for more than 98%. The rest of the population consists of the Muong, Tay, Nung, Tai, Hoa, and Dao ethnic groups. The subdelta climate, with an annual average temperature of 23°C, is divided into two seasons: the dry season from November to April, and the rainy season from May to October. The old city of Ninh Binh is one of many famous historic sites in Vietnam. Other sites in this area include Hoa Lu Citadel, Nhat Tu Pagoda, and Can Linh Pagoda. Restaurant with 50 seats serving Asian and seafood dishes . Air-con , fan, satellite , IDD phone and private bathroom with hot shower. All rates included breakfast, government tax and service charges.